This thesis examines the reception of Thucydides' History of the Peloponnesian War in US foreign policy debates since the end of the Cold War. It begins with a background survey of Thucydides' use in foreign policy debates up to and during the Cold War, primarily by the realist school of international relations, and the comparisons which were drawn between the Cold War and the Peloponnesian War. After the Cold War, these comparisons became less relevant to current debates, and critics of realism began to use Thucydides to support their own theories. 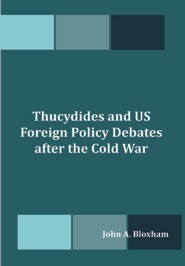 The emphasis is on how the three key movements since the Cold War, realism, liberal internationalism and neoconservatism, have each seen aspects in Thucydides' writing to admire and utilise for their theories, at the same time building competing interpretations of key sections from Thucydides' History. At the same time, as well as drawing abstract theories from Thucydides, analysts have also drawn historical parallels between the present and the Peloponnesian War in a creative process which results in modern states playing different ancient roles depending upon the context. I show that Thucydides' text lends itself particularly well to such recycling due to the author's tendency to highlight complex tensions without providing explicit authorial 'answers'.